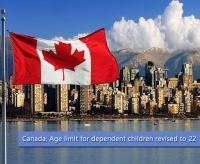 On Wednesday the Canadian Government published a major change in order to increase the maximum age limit for a dependent child. This reform will make more families stay together. The published reform is considered to showcase the Canadian Government’s commitment towards family reunification. As per the amendment the revised age limit of “under 22” will be in effect from 24th October 2017 onwards. Currently, it is an “under 19” permissible age requirement. The revised age limit will be applicable for the new applications under all immigration programs conducted by the Immigration, Refugees and Citizenship Canada (IRCC), including for refugees. Children of any age (even above 22) who rely on their parents/guardians due to any physical or mental health condition will continue to be considered as dependent children. The amendment in the age limit will lead to more positive social and cultural impact by making families stay together.